Size of Male: 20 lbs, 13-16 in. Size of Female: 20 lbs, 13-16 in. The Shetland Sheepdog, or Sheltie, is an intelligent and sensitive breed. Though fairly easy to train, they grow very attached to their owners and are unsuitable for people without much time. They are very sociable and get along well with other humans and animals. They do not do well with tension or loud noises but react well to different climates. 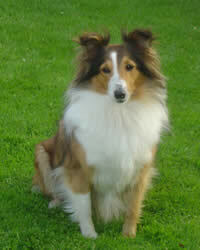 The Sheltie is descended from Scottish herding dogs. These dogs derive from early collies and were developed on the Shetland Islands. Once raised primarily as farm dogs, they began to be shown around 1906. Today, the Sheltie is one of the most popular breeds of dog in the world. Shelties are remarkably intelligent and willing to please their owners. These dogs are very obedient and are devoted to their families. They are excellent with children and other animals, though they can nip during play due to their natural herding instincts and they must have proper training. These dogs can be timid toward strangers. Living Environment – The Shetland Sheepdog breed does well in a calm family environment. While they have lots of energy and enjoy play, they do not react well to tension. They need a secure area to play and thrive, with a yard that allows them to run off-leash. Grooming – Shelties are fairly low maintenance. They require brushing twice weekly, though more may be necessary when the dog is heavily shedding. The Sheltie is considered to be a medium seasonal shedder, which should be taken into account by households with allergy sufferers, READ: they are not good dogs for people with allergies. Diet & Exercise – The Sheltie is a high energy breed and needs regular exercise. While off-leash play is highly preferred, it must take place in a fenced yard due to the dog’s tendency to chase animals and objects. Health – Shetland Sheepdogs have a life expectancy of between 12 and 14 years. There are many dog health problems to look out for with these dogs. Some of the more common concerns are canine epilepsy, canine hypothyroidism, luxating patella, dog eye problems, seizures, canine heart disease, canine hip dysplasia, progressive retinal atrophy, and von Willebrand disease. Parents of these dogs should have CERF and OFA certificates. Dog training is relatively easy with Shelties and they excel in obedience and herding training. They are highly intelligent and are willing and eager to obey. Working environments also suit these dogs, due to their natural herding instincts. They are very sensitive by nature and do not respond well to harsh or heavy handed training methods. Positive dog training works best.